We had a very successful summit with a great mix of incumbents, candidates, shop owners, educators, MSHP and citizens. Thank you to all that participated and in sharing information on vehicle repair trends that you see in your shops every day. We were able to educate our guests on the facts compared to some of the myths and incorrect information that had been presented during the last legislative session during debate for HB1444. This evening was important because there is a very strong possibility that this bill will be introduced again in the next session. Our guests were surprised by how comprehensive the Missouri State Safety Inspection is and how many components are actually inspected. 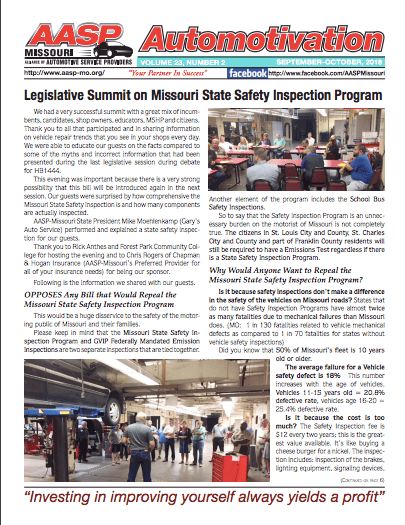 AASP-Missouri State President Mike Moehlenkamp (Gary’s Auto Service) performed and explained a state safety inspection for our guests. Thank you to Rick Anthes and Forest Park Community College for hosting the evening and to Chris Rogers of Chapman & Hogan Insurance (AASP-Missouri’s Preferred Provider for all of your insurance needs) for being our sponsor.